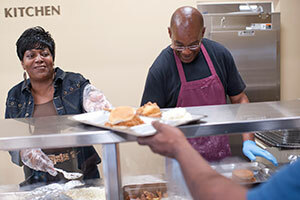 Make a difference in the lives of homeless and hungry men, women and children throughout the Triangle by volunteering with the Durham Rescue Mission. With volunteer opportunities available for individuals, families or groups (church, school and more), you’re sure to find a volunteer option that suits your needs and schedule. Choose to volunteer on a daily, weekly, monthly, or even a one-time basis. When you choose to bring a meal to the Durham Rescue Mission, you’re helping feed the hungry men, women and children of the Triangle. Buy your food, cook it at home or in your organization’s kitchen, then bring it to the Mission. You’ll set up to serve your meal at the Mission, then help clean up. Come cook with our Residents in the Durham Rescue Mission kitchens, at either our men’s or women’s shelter. Buy your food and cook it in our kitchen. You’ll set up to serve your meal at the Mission, then help clean up. Use the food in our pantry, cook in our kitchen, set up, serve the meal and clean up. Our residents will prepare the meal. You or your group can bring homemade desserts, set up, serve the meal, and assist with clean up. Volunteer in one of our thrift stores. We have a number of volunteer opportunities available for individuals or groups interested in getting involved with the Durham Rescue Mission Thrift Stores in Durham, Chapel Hill and Raleigh. Interested in volunteering more than just your time? We’re always accepting in-kind donations of gently-used items, including clothes, books, furniture and much more. Help with one of our community events. 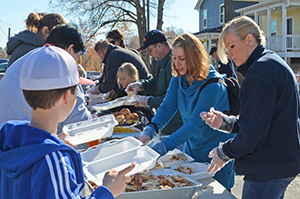 The Durham Rescue Mission hosts four Annual Community Events each year. These events are designed to give back to the Raleigh-Durham-Chapel Hill community by helping the homeless and the working poor. Each community event is planned to provide a fun-filled day for guests. If you are interested in volunteering at one of these events, we would love to hear from you. At the Durham Rescue Mission, we offer residents the opportunity to receive their GED certificate. You can help residents complete this goal by volunteering as a tutor in Durham. Conduct a drive for food, toys or personal hygiene products. 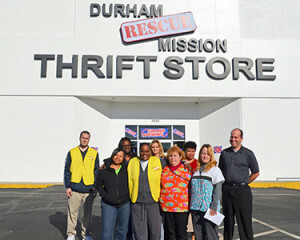 We’re always looking for donated items to meet the needs of the residents at the Durham Rescue Mission. Planning a food drive, toy drive or other charity drive is a great way to help our ministry. We would like to invite you to join the Durham Rescue Mission Ambassador’s Club! We are continually in need of Ambassadors who are willing to give 3-4 nights a year in learning the needs of the Mission, and who will take that information back to their church family or business. An Ambassador may be the Pastor, CEO, a church member, or staff member that is willing to be the heart and hands from your organization to the Mission. Ambassador Club Members’ participation is vital to the ministries of the Durham Rescue Mission. With your help, and the involvement of your church or company, we can continue to help those in need in our community. Update your Pastor / church family / CEO / Business on current projects and needs at the Durham Rescue Mission. To learn more about individual and group volunteer opportunities at the Durham Rescue Mission, or learn about our ambassador club, please contact us at 919-688-9641 ext. 5025 or email us at volunteers@durhamrescuemission.com. Before volunteering your time at the Mission, please take a look at our volunteer requirements.